PALM SPRINGS, Calif. -- In golf, as in life, what you don't know actually will hurt you -- or at least impair a good time. Though less famed than the Dye, Nicklaus and Palmer designs at PGA West, the Greg Norman Course is not to be missed. The Palm Springs region and entire Coachella Valley offers one of the country's best pockets of prime golf courses. But by digging beneath the topsoil, one will uncover a host of fun and engaging desert challenges that are certain to elude most travel guides. To that effect, here are four courses that shouldn't be overlooked when planning your Palm Springs golf getaway. To paraphrase from Jon Landau's 1974 critique of Bruce Springsteen: "I have seen the future of golf and it just may be the Greg Norman Course at PGA West." With a dearth of turf (fewer than 70 acres), a wealth of manageable par 4s (from the championship tees none play more than 450 yards) and a setting that astutely weaves a natural solitude through a scarcity of homes, this very well may prove the kind of grounds your grandkids will play when course construction is renewed in coming years. To wit: Less water is required for maintenance, greens are reachable for the mid-to-high handicapper and the player actually feels some sense of privacy here. The pithy, 337-yard, par-4 11th is seminal of such design; though bunkers abound, the tenets of accuracy and club consideration are paramount to par. Though less famed than the Dye, Nicklaus and Palmer designs at the umbrella ownership La Quinta Resort and PGA West, the Norman is not to be missed. The desert is filled with community-style courses that can be overlooked. 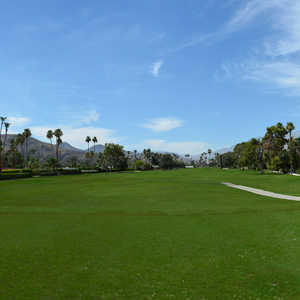 Heritage Palms Golf Club in Indio is among the chalk of these underrated tracks, and perhaps it's apropos that the grounds were drawn by Arthur Hills, one of the country's most underrated designers. Highly playable, well manicured and endlessly fun, Hills makes use of seemingly every inch of the Heritage grounds. Though tipping out at 6,700 yards, the course presents expert employ of lake water, waste areas and teasing sightlines to keep even low-handicappers honest. For the average/older player, both landing areas and green complexes are sizeable to keep play well-paced and scoring opportunity prevalent. Oh, and the sand is so soft, you'll feel like the 56-degree is navigating a silken bed sheet teased with melted butter. The three nine-hole courses offer opportunity for shot-shaping, family time and confidence-building fun. Not that Ted Robinson's late 1970s designs are a pushover. For ultimate enjoyment of these playable grounds, be sure to slate the West Course into your schedule. The West nine begins in surprisingly penal fashion with a dogleg left par 4 followed by a beastly par 3 and Herculean par 5 -- all told, the first three holes sport nearly 1,800 yards from the tips and will test single-digit handicaps. But after the teeth are aptly ground, a pleasing resort experience is born. The West opens up on the 347-yard, par-4 fourth before a fine risk-reward ensues on the diminutive, 301-yard, par-4 fifth. (Tip: Be sure to investigate your landing area here; an iron off the tee is advisable). The 129-yard, par-3 sixth plays poolside and offers spouses, pals, parents or offspring the fun opportunity to place a quick call to party members and say, "C'mon and watch me hit this green." Another of the desert's undervalued, residential-lined tracks is Woodhaven Country Club in Palm Desert, where, like Heritage Palms, all players are given opportunity to score and to do so at a snappy pace (which isn't without merit in the summer and early autumn months). While tight and tiny at just 5,800 yards, the course isn't without teeth. Accuracy is a premium here, as well as a solid iron game. Holes Nos. 4-7 are evident of such exacting play translating to scoring confidence. The 394-yard, par-4 fourth is the top-handicap hole and asks for a considered tee shot followed by a strong approach. On the ensuing fifth, players should dial back and conservatively use a 7-iron from the tee to avoid water on the right and set up a great birdie opportunity on this 263-yard par 4. The par-3 sixth is all carry over water before the 489-yard seventh (just one of two par 5s on the par-70 layout) demands a deft tee shot for those aiming to acquire the green in regulation. For a visitor looking to squeeze in a quick prep round prior to playing some of the area's Big Dog venues: Woodhaven is a fine play to start.